Jeffery Lynn Goldblum is a gift to this planet. There is no one quite like him, and there will never be anyone quite like him. His unique presence has graced us in movies like The Fly, Independence Day, and Thor: Ragnarok, but it's his role in Jurassic Park that is perhaps the most memorable. 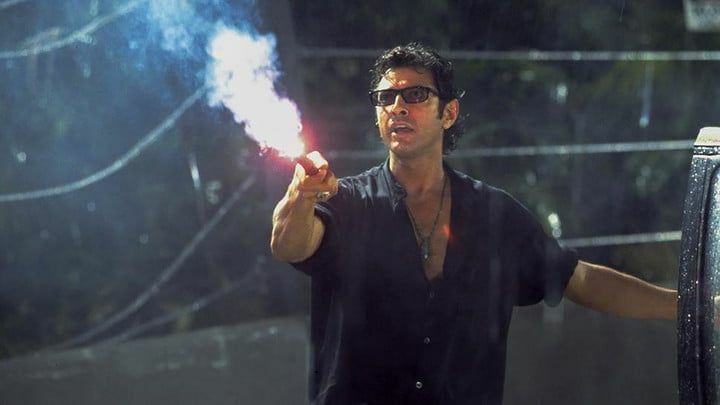 Goldblum plays Dr. Ian Malcolm, a mathematician who specializes in 'Chaos Theory.' He's brought to the park, along with Dr. Sattler and Dr. Grant, to assess and see if it's up to snuff. Obviously, we all know how this goes. Our poor Dr. Malcolm gets stuck in a car and when the T-rex gets loose and is attacking the children, he has to step up to save the day. He bravely outruns a T-rex with a flare, leading it away so the kids can escape with Dr. Grant. When they find him, he's badly injured and is brought back to where John Hammond, creator of the park, is hiding. This is when one of the most iconic movie moments to ever happen takes place. 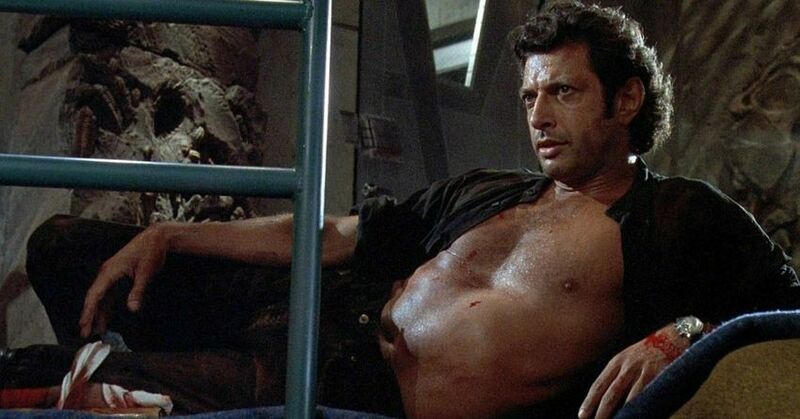 While bleeding from the leg, Jeff Goldblum takes a moment to pose while the camera looks over him. He's sweating, his shirt is unbuttoned WAY further down than it used to be, and he's leaning in a very excessive way. Goldblum spoke about the moment in an interview in the spring. "It's supposed to be Costa Rica, right?" he said. "So things are hot and I'm sure I'm in some sort of fever. All the logic is that we got to get some of these wet clothes off immediately. As I remember, I don't think anybody fought me on that." It looks like he's trying very hard to seduce someone, and we were all 100% here for it. The moment is still one of the best memes to go around the internet, even though the movie came out 25 years ago. 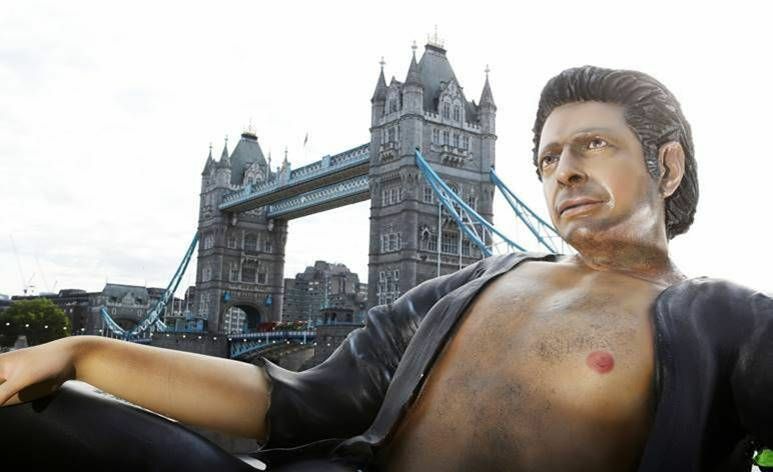 Because it's the 25th anniversary of the classic dinosaur movie, someone decided that the celebration needed to be bigger, better, and have more Goldblum than anyone else's tribute. 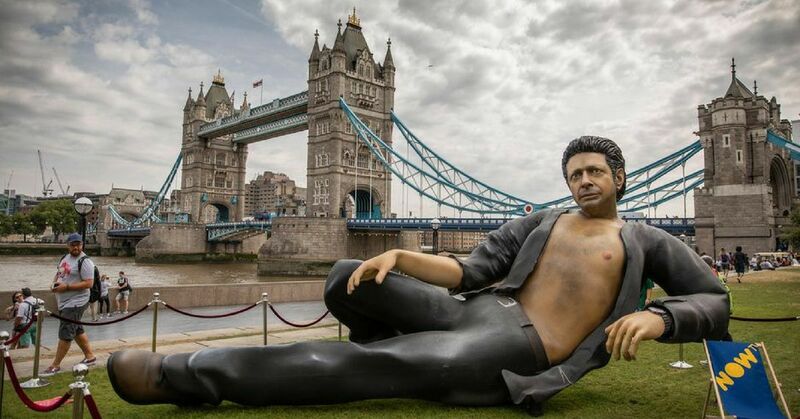 Now TV, a streaming service in the UK, decided to pay homage to Jurassic Park with a dinosaur-sized statue of the iconic Ian Malcolm moment. That's right, the sultry Dr. Ian Malcom, leaning on his side is out in the world now and he's 25 feet long. The statue measures nearly 10 ft high and 23 ft long, and weighs over 300 lbs. It took six weeks to build it, and now it resides right next to the Tower Bridge. 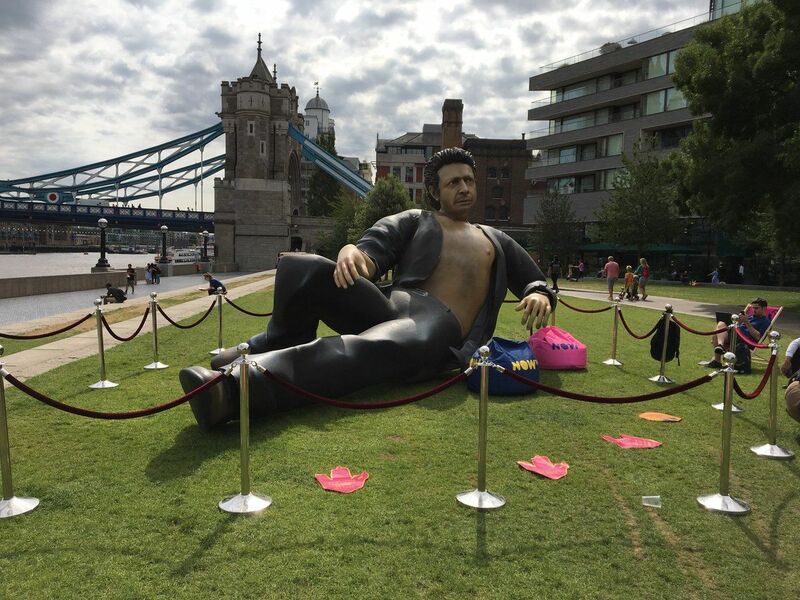 He's going to stay there until July 26th, so it gives a lot of people a chance to go to London and get a picture of the glorious creation. 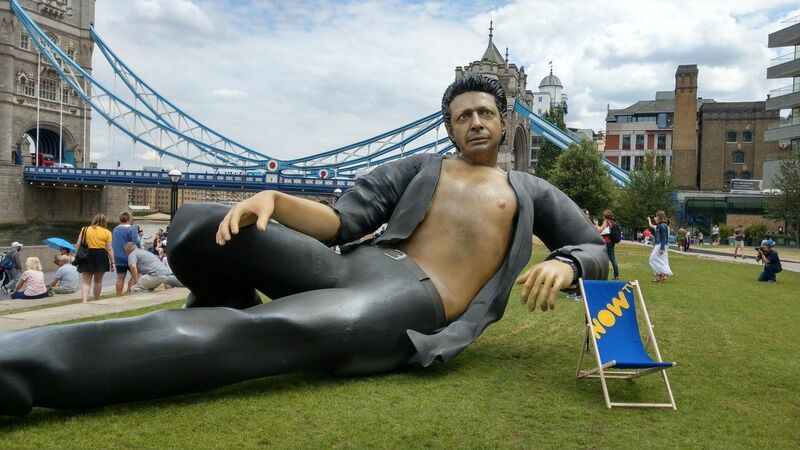 While the movie has no connects to London, it's nice to know that Dr. Ian Malcolm is getting the attention he deserves. Jurassic Park is one of those movies that will never go out of style. The acting is all on-point, the technology they used was so ahead of its time, but most of all, Jeff Goldblum is 100% perfection.